Josep Gombau named the expected side in the usual 4-3-3 formation, despite dabbling with the 3-4-3 on Friday night. Marcelo Carrusca returned to the head of the midfield triangle, Nigel Boogaard passed a late fitness test to start at centre-back, and Awer Mabil replaced Fabio Ferriera on the right hand side of the attack. Kenny Lowe was forced to make a change to the side that had started the last two A-League matches, with Mitch Nichols ruled out with a hamstring injury. Ruben Zadkovich replaced him in midfield. Adelaide’s tactics are obvious under Gombau – they settle in possession very quickly, looking to set the tempo of the game early on by establishing their excellent ball retention in deep positions. One of their great strengths is the back four’s ability to make good decisions when playing out, and adapt their positions and structure so that a defender can carry the ball forward into midfield. Here, Adelaide got great joy pushing the full-backs very high up the pitch. 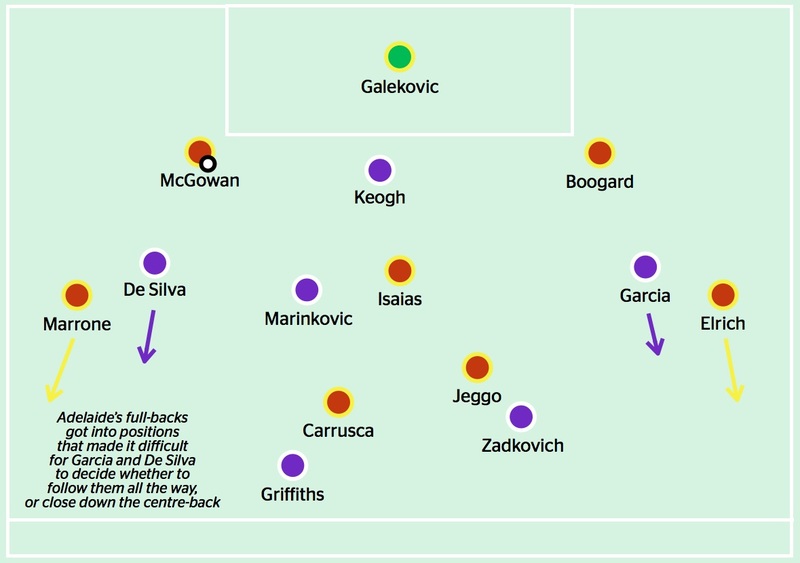 With Perth Glory defending in a 4-1-4-1, Andy Keogh had to work between the two centre-backs, with the wingers, Richard Garcia and Daniel De Silva, positioning themselves where they could block off the pass between the centre-back and full-back. The problem here was that Michael Marrone and Tarek Elrich were pushing so high up the pitch that Garcia and De Silva were being forced into awkward positions, uncertain about whether to track the full-back all the way, or push up onto the centre-back. Even if Keogh applied pressure, sometimes supported by Nebojsa Marinkovic (who was also occupied with Isaias), Adelaide found a way to get past the first line of pressure, predominantly via the full-backs, and thus progress the ball upfield. It was similar to the situation when Adelaide switched from 3-4-3 to a 4-3-3 v Brisbane, who, like Perth, had three players in their first line of defence wherein the wide players were caught between applying pressure to the man in possession, or tracking the full-back. Throughout the first half, Elrich and Marrone were the two players making inroads going forwards. They were helped by the fact Mabil and Cirio stayed high and wide, therefore pinning back Perth’s full-backs Scott Jamieson and Josh Risdon – important, as both like to get forward. As a result, there was lots of space Adelaide were able to carry the ball into, and Marrone and Elrich were responsible for their most incisive attacks, with the former often cutting inside and running through the heart of the pitch. On a few occasions, too, Boogaard and McGowan had acres of space in front of them to dribble into, because of how Elrich and Marrone were dragging Garcia and De Silva away. Rostyn Griffiths and Ruben Zadkovich worked together to pick up Carrusca, and at one point, Lowe was heard audibly on the TV cameras screaming at his midfielders to prevent Marcelo Carrusca from facing forward. In one sense, this tactic worked, because Adelaide created little in central positions during the first half. The bulk of their chances came down the flanks, where the two wingers whipped low crosses across the face of goal, in the ‘corridor of uncertainty’ between Perth’s back four and Danny Vukovic. This was, of course, the position Awer Mabil blazed that early shot over the top of an open goal. Where Perth looked dangerous was when they won the ball and then transferred it forward quickly. Adelaide’s defence held a very high line, and twice inside the space of two minutes Perth nearly got in behind. It was fascinating to watch, because the Adelaide back four actually did quite a good job organising themselves into a flat line in extraordinarily advanced positions, which often meant Keogh, who constantly made runs in behind, was caught offside. However, when another midfielder burst forward beyond the back four, Adelaide had problems – most obviously when Garcia darted through on goal, but was denied by Eugene Galekovic coming quickly off his line. Two examples of this can be seen in the video below. Perhaps taking stock in the fact his side’s best chances were coming on the break, Lowe took off De Silva at half time and brought on the pacier, more direct Sidnei Sciola. Sidnei was better suited to Perth’s approach in this match, because he drove at goal with the ball at his feet and upped the speed of their counter-attacks. On 57 minutes, Risdon was shown a red card for his second yellow. After the red, Lowe switched to a 4-4-1, with Ruben Zadkovich moving to right-back. Keogh continued to press energetically high up the pitch, but Adelaide were now easily able to work the ball forward. If they had control of the game through their possession, it was now exaggerated by the 11v10 situation, as they calmly worked the ball forward into the final third. Isaias, for example, finished as the game’s highest passer with 90 passes – 52 of those came after the red card. Like against the Wanderers, he was free in space because Perth dropped their two lines of four very deep, defending compact on the edge of the penalty area, and thus had no-one to pressure Isaias. He came close to scoring a second, hitting a piledriver that was palmed away from the top corner by Vukovic. Adelaide as a whole responded very well to having an extra man, because sometimes teams struggle when attacking against ten men sitting behind the ball. They moved the ball quickly to pull the block out of position, using the width of the pitch to stretch Perth’s defenders and then attacking the gaps when they opened up. The goal was an excellent example of this, stemming from a sixteen pass move that started on the right, moved across the pitch, and then Carrusca providing the excellent through-ball for Cirio’s run in behind. Perth chased the game by throwing Jamie MacLaren on for Marinkovic. MacLaren defended the right flank, and charged forward into goalscoring positions when attacking (so playing something of a hybrid winger/forward role). This lifted Perth momentarily, but Adelaide were comfortable enough to close out the game. This wasn’t so much Perth doing anything wrong as Adelaide simply doing their system very well. Possession-based football isn’t the ‘magic’ answer to football, so although Adelaide finished with 66% of the ball (and completed 525 passes to 268), this was a victory for a team playing a system well, rather than the system itself. Still, It’s a fitting reward for a coach that was bizarrely criticised for his initial attempts to transition Adelaide towards this style of play. Admittedly, their start under Gombau was poor results-wise, but it was clear their performances were improving week in week out as they got to grips with the demands of the system. Unfortunately, there’s not always a correlation between performances and results in football, but anyone watching Adelaide’s first games under Gombau should have come away with the encouragement that they were heading in the right direction. It also helped the brand of football he was putting in place was very entertaining, which won over those actually attending matches and observing the team’s performances (which might explain why the early opposition to Gombau always felt media-driven, rather than fan-driven). An FFA Cup win is a vindication of not only the revolution Gombau put in place in terms of playing style, but also the adaptions he has made to suit the pace and ‘feel’ of Australian football. There are, granted, still flaws in the ‘Barca-lite’ approach, and these have been obvious from day one. Crucially, though, when Adelaide play the system well, they do it better than the majority of their opponents, and thus stamp their influence and control over matches. Here, they successfully controlled the pace of the game and created more chances than their counterparts. Perth didn’t get a shot on target in the entire 90 minutes, and Cirio, one of the ever-presents of the side from the very beginning, fittingly scored the winner.